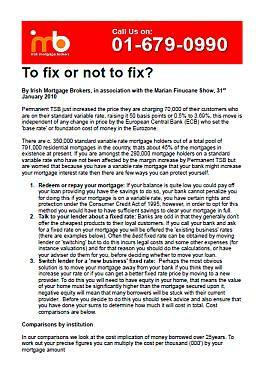 Last Saturday Charlie Weston (award winning Personal Finance editor with the Irish Independent) Karl Deeter (of Irish Mortgage Brokers) were on the Marian Finucane show on RTE 1 (audio here), during the show Karl mentioned a file with mortgage rate information on it that you could download. The file was a mid-sized pdf but they don’t embed easily in the existing site for the show so we are posting it on our site and RTE Will link to it instead. The file in question is here or you can click on the image to the left, if you have any questions feel free to call us at the number which is at the top of every page on this site. Thanks for listening and for your enquiries, we were delighted to have a representative from our firm on such a big show, we are huge fans and we hope our opinions offered some help to you, the listeners.